When I found myself hunting for an apartment for the third time in 18 months, an uncomfortable feeling of weariness started to seep into my bones. Looking for a place to live is daunting in a place like Toronto, where the competition amongst renters is fierce. 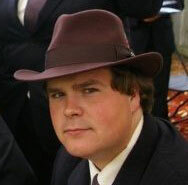 One must avoid slum lords, master a knowledge of tenant rights, make cold calls, and prepare to hand over more personal information than your mother knows about you to a complete stranger. But instead of succumbing to apartment hunt exhaustion, I decided to give it a Web 2.0 punch and make finding the perfect place to live nearly automatic. When you need to find nearly anything these days, you turn to Google. So it’s no surprise I employed this search giant’s myriad services to help find a new apartment. Take Google Reader and add several custom, search-based RSS feeds, a shared Google Document, and a Google Maps mash-up on the side – you’ve got a perfect recipe for a successful apartment hunt. I started by hitting Craigslist and conducting a search for an apartment in the area I wanted. Most people know they can type in a neighbourhood or street name to filter down the results, but few know you can combine these searches into one feed. Say you want to see all apartments listed along one specific street, and also all apartments described as being located in a neighbourhood. 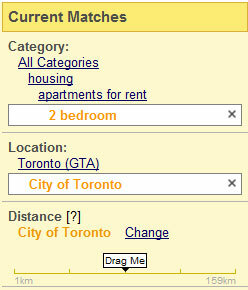 Just type both names into the search, separated by a | so it looks like this: “street|neighbourhood” and then fill out the fields for rent, bedrooms, and hit search. You’ll get a tailored list of results. Search multiple terms at once by separating words with |. Now scroll all the way to the bottom of your search and find the orange “RSS” button. Click it and add the feed to your Google Reader. Next, I padded my results by adding similar search-based feed from Kijiji. This free online classifieds service also allowed me to search by key word with several filters applied such as number of bedrooms and price range. But I couldn’t find a way to include multiple search terms at once, like I could do in Craigslist. Instead, I did three separate searches for the three areas I wanted to find an apartment in, and saved each RSS feed to my Google Reader. Hone in on your target using filters. In Google Reader, I created a folder named “Apartments” and put my four new RSS feeds into this folder. Now clicking on this one folder gives me the up-to-date listings of all the apartments in the area I’m interested in, in my price range. My search just got a lot easier. My roommate and I shared a Google Document to highlight apartments we were interested in viewing. We’d share a link to the online listing and write down a few details about the apartment, and the landlord’s name and contact. We’d write down times we scheduled viewings for and then rate the apartments if only one of us could attend the showing. This tool helped us avoid calling the same landlord twice, and helped us fit apartment viewings into our busy schedules. Finally, I used Zoocasa to search for an apartment by neighbourhood. Or if I wasn’t sure what neighbourhood an apartment belonged too, I could type in the address to get the result. 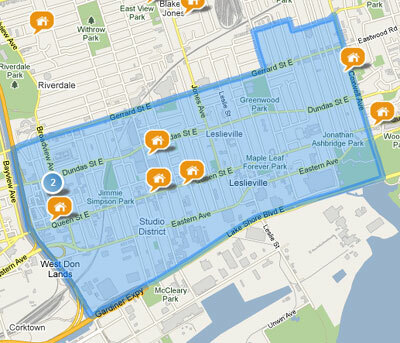 Zoocasa maps out neighbourhoods on a Google Map with clear boundaries. Thanks to these helpful Web-based tools, I didn’t have to find my new apartment. It found me.